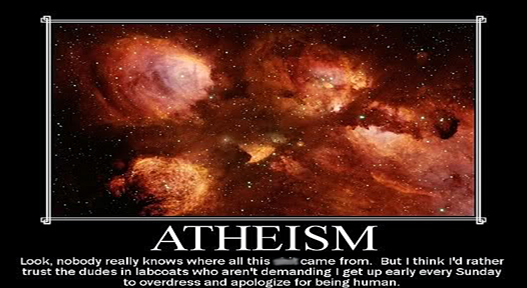 When I read this graphic on an Internet atheism community, I started searching my mind. When was the last time anyone — even my wife — “demanded” I get up early every Sunday and go to church? I’m still searching and still haven’t found a single instance. pray together and for each other and for a world that I think we can all admit isn’t doing very well. So has it ever happened where one Christian has demanded or “guilted” another into attending church services? I’m sure it has, but I’ll venture to write that those occasions are truly regrettable. No one should ever be forced to attend “religious” events. It should *always* be voluntary. What about “overdressing”? Um, welcome to 1955; they want their suits, fedoras, dresses and white gloves back. In a vast majority of North American churches, what you wear is pretty much irrelevant. The church I attend includes teens in jeans and T-shirts, seniors in suits and dresses, middle-aged men in cowboy boots and even recent African immigrants who love wearing their colourful ceremonial outfits. For many years, I haven’t gone to church in anything fancier than jeans and a golf shirt. Are there churches where your clothing matters? Yes. But a majority of those churches are in decline; God doesn’t care what you wear to church, since He knows you inside and out and isn’t fooled by fancy and expensive outfits. Apologize for being human? I suppose some people might think that’s what happens. But what really happens, in most Christian churches, is people apologize for the wrong things they’ve done and the right things they’ve failed to do. Let’s be plain here: in the Bible (which most Christians take seriously) Jesus Christ never once asked a single person to “apologize” for being human. And He still doesn’t today. Bruxy Cavey, a Canadian pastor, tweeted this about our humanity: “I’m only human.” There is nothing “only” about being human. Why did Bruxy tweet that? Because God made you and I and everyone else human. God made His Son human. So to “apologize” for that or feel bad about that is to insult our creator. Finally, “nobody really knows where all this came from”? Well, where (and who) else would it come from but God? In the end, while I very much appreciate the work done by dudes in lab coats (their work often tells me how God does stuff) I’d rather trust my creator. Because I love Him and follow His Son, I have a better life NOW. And I have ETERNAL life with Christ. Not even the most celebrated scientist can offer me that. What are your thoughts? Post them below and let’s have a conversation. 1.Could you please outline ( briefly) how individual or communal prayer has any influence on society at large and can you identify with verified evidence any instance where theistic intercession has taken place as a direct result of such prayer. 2a. When you say the world isn’t doing very well are you saying this as a generalization or in comparison with other times – say the Middle Ages for example or the Forties? b. Can you identify where religion ( specific and general) has been /continues to be a genuine force for good over and above what secular humanism has/is. 2. When I say the world isn’t doing very well, I’m thinking of human trafficking, corruption, an economic system that keeps rich countries rich and poor countries poor, politicians who would rather feather their nests than do right by their people, business leaders who care only for stockholder value, etc. 3. I can’t identify anything good about “religion”. I’m not interested in “religion”. I’m interested in a relationship with Jesus Christ, that starts NOW and continues into eternity. That said, there are Christian aid groups helping people right now in Nepal, in Northern Iraq, in Liberia, in the Philippines, etc. That’s a force for good, whether or not secular groups are doing the same. I can’t say my parents forced me to church. “Strongly insisted” might be a better term. But as far as “apologizing for being human,” I’d call that accurate. 1. All humans are sinners (except Jesus). 2. All sinners must apologize or burn forever. 3. Therefore all humans must apologize for something they are. They must apologize for being human. I don’t know how this is taught outside of the Lutheran faith, but I’ve never heard a Christian say that a normal person can choose not to sin and be successful at it. I’ve also never heard a Christian say that repentance was optional. Unless you can dispute either of those points it seems the formula would still hold for all Christians. It is a core doctrine, and I regard it as one of the most harmful things Christianity gives us. Thanks for your comments. As far as I’m concerned, apologizing for sins is very different than apologizing for being human. I disagree with the second and third supposition. All sinners must commit their lives to Jesus or else they must face the consequences of their sins – the wrong things we’ve done and the right things we’ve failed to do. When we commit our lives to Christ, God sees us as He sees His Son: perfect in every way. And as I wrote in the essay, God made us human, so to apologize for that is to insult your creator. That strikes me as two sides of the same coin. Damnation is the consequence of sin unless we repent and follow Jesus. Repentance is expressing contrition; it’s apologizing. Without it you face eternal punishment. Same thing, different words. And it doesn’t really work to just repent once and be seen as perfect. We continue to sin, we must continue to repent of that sin. In the Genesis creation story, God creates people along with their ability to sin and also provides the impetus. He placed the tree, he created the serpent and placed him there, and then he waited for the inevitable. Unless you want to claim that omniscient God didn’t know what was going on, he created us as sinners. If he had truly created Adam and Eve as perfect and sinless, it would have been trivial for them to ignore the serpent. The original sin belongs not to Eve but to God for creating man as he did, and then creating a rigged system whereby man must be continually in repentance for the way God created us. Stan, although I don’t practice religion like I used to, I do remember and understand that the main teachings of Christianity is based on the forgiveness of sin by the grace of God. It is not based on apologizing for being human, but for doing the wrong things that are considered “sins.” The focus is not so much on our sins, but more on the grace of God through Jesus. In other words, it’s not about our efforts to do good, but about God’s complete intervention to make us righteous in spite of us not doing good. Okay. .Let me try again. A similar sense of spiritual well-being can be obtained through meditation or some say Yoga. I was actually referring to intercessionary prayer, Frank. As you are directing your prayers to your deity, have you any verifiable evidence that such action has produced results? Fair enough. I see where you are coming from. But much of these problems have been with us since the off. Look at the bible. Replete with some pretty heinous stuff. So basically, same nonsense different era, yes? However, at least we are currently not at war – globally – and there have been huge advancements in the fields of technology, science, medicine, space exploration etc In my own country, democracy. Sadly region only seems to have exacerbated so much of the negative qualities rather than bridge the divides, wouldn’t you agree? A force for good indeed! And good for them. Do they evangelize at the same time? Do you think they should? How is a ‘’relationship’’ with Jesus of Nazareth improving/would improve the well-being of these same folk in the countries you have listed above in the previous paragraph? Thanks for your comments. Let me try again…. 1. Of course I don’t have “verifiable evidence” that prayer produces results. If I did, that would be proof of God’s existence. Then YOUR freedom to declare there is no god would be destroyed. 2. Yes, “religion” often exacerbates humanity’s negative qualities. Just one more reason why I want nothing to do with “religion” and everything to do with Jesus Christ. And yes, there have been advancements in many fields. But, I’m very sad to write, the human heart is as sinful now as it was in Bible times. That hasn’t changed a bit – and you don’t have to look far to find verifiable evidence. 3. I certainly hope that Christian aid groups are providing spiritual as well as physical aid to hurting people. To ignore their spiritual needs is to do a very incomplete job. And to not tell people the reason we are helping — Jesus Christ, who lived, died and was resurrected for EVERYONE who believes in Him and follows Him — is to spit on everything He did, and is doing, in this broken world. A relationship with Jesus improves family life – teaching men to value their families and not abuse them; improves their attitude about other people – they’re not enemies or less human, they are LOVED by God; improves their sense of generosity (Jesus says whatever you do to the “least” of other people, you have done to Him). Those are just off the top of my head. So therefore you would agree that its primary function is to make a person feel good. No different to meditation or Yoga, yes? Sinful? That’s a religious term, Frank. I contend that religion and any form of god belief only exacerbates the negative. It divides rather than embraces humanity because of the reward & punishment doctrine. Believe … or else. If we got rid of this would it not produce a more open loving environment for all? How did he change anything, Frank? He didn’t really die if he came back to life and as you have stated ‘’sin’’ is still as widespread. Furthermore, why should a Buddhist, who may currently have a completely fulfilling spiritual life with his family and community, change to follow your deity? What evidence could you possibly demonstrate to verify your claims? I have a great family life – do you ever read my blog? Why would you think I, or any non-believer would abuse them simply because I do not follow your deity? Muslims feel they are loved by their god, who incidentally is the same as yours. Are you truly saying belief in the character Jesus of Nazareth makes a person more generous (define generosity) than non-believers? Do you have stats to demonstrate this? 2. Thanks for your contentions about “religion”. I disagree with the assertion that getting rid of the idea of God would create a better environment. We all saw the results of that in the Soviet Union, especially under Stalin. 3. Jesus changed a lot of things for a lot of people. This essay contains just ONE example: http://wp.me/p2wzRb-5g. Sin continues to exist because of the gift of freewill. I stated that coming to Christ can improve family lives because it has, often in developing countries where women are second-class citizens. In my job, I’ve read about many examples. And the last time I checked, Islam has no concept of grace as it’s defined by Christians. So the Muslim version of God is certainly NOT like the God of the Bible. Not sure if my last comment actually posted. I don’t see anything here? So the Muslim version of God is certainly NOT like the God of the Bible. The Muslim faith/ religion is based upon the Abrahamic god, Yahweh. Abrahamic religions (also Semitic religions) are monotheistic religions of West Asian origin, emphasizing and tracing their common origin to Abraham or recognizing a spiritual tradition identified with him. They comprise one of the major divisions in comparative religion, along with Indian and East Asian religions. As of the early 21st century, it was estimated that 54% of the world’s population (3.8 billion people) considered themselves adherents of the Abrahamic religions, about 30% of other religions, and 16% of no organized religion. So why do you deny this? I’ve already explained the difference between the God of the Bible and other gods. I’m satisfied with that explanation. We are talking about Yahweh. This is the god of the bible, Frank. As I’ve already stated, I’m talking about grace, which to my knowledge is not part of any other monotheistic faith. This does not change that the god of the bible is Yahweh. I have several bibles and Yahweh is in each and every one. As far as I am aware only Marcion ditched him but he was later declared a heretic. For Jews, Christians, Muslims, it is the same god, Yahweh. He is the Abrahamic god – no matter how each religion represents him. Or are you like Marcion and flatly reject Yahweh, Frank? I’ve stated my position and this conversation appears to be going nowhere. So it’s now finished.